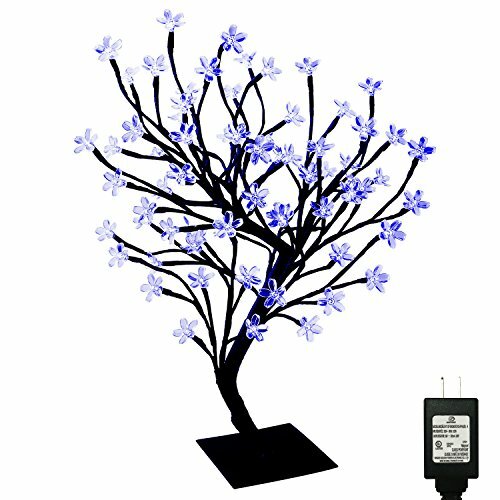 Our Cherry blossom tree really is a fantastic item,at a great price and even better quality! You can bend and shape the tree branches to create a unique experience. With Memory Function,it can remember the last setting,and no need to re-set when you turn on the power again. (1). Combination (2). In Waves (3). Sequential (4). Slow Glow (5). Chasing/Flash (6). Slow Fade (7). Twinkle/Flash (8). Steady On. Great addition for Festive,Wedding,Birthday Party & Christmas decorations. Suitable for indoor all year around. 23 inch height cherry tree light embellished by 90 Red LED lights. Equipped with a 29V safety voltage adapter with UL certification. Cable Length:9.8ft. Variable mode (8 Modes) settings ideal for room decoration,christmas, party, wedding, ceremony, celebration and other occasions.